BLANK PUZZLES: Many Sizes In Stock! Home > BLANK PUZZLES: Many Sizes In Stock! Ideal for Inkjet & Sublimation Printing. Our blank white puzzles are specially made for digital transfer printing & sublimation. The tops of our puzzles are made with a bright white (soft micro finish) fabric. We stock the most popular sizes! (Please note: 30 piece puzzle is shown in picture). that work great with these puzzles. printing or our "TransferJet" inkjet heat transfer paper. because you will not be able to remove the laser paper! Additionally, you must use a heat press. Using a home iron will not work. We no longer carry puzzles for standard digital transfer papers. 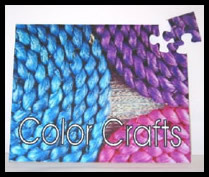 We only carry puzzles for sublimation. Please see the sublimation section on our site.